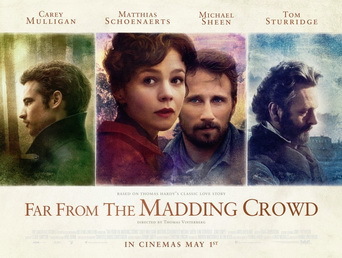 The latest adaptation of Thomas Hardy’s classic ‘Far From The Madding Crowd’ is a sumptuous period affair, superbly directed by Dane Thomas Vinterberg. Having not seen John Schlesinger’s 1967 adaptation starring Julie Christie as the protagonist Bathsheba Everdene, or read the novel, I was coming into this blind but with high hopes due to a stellar cast and Vinterberg’s direction. Vinterberg’s previous film, ‘The Hunt’, starring Mads Mikkelsen, was one of the most powerful and thought provoking films I’ve seen in some time, and he brings the same power to enliven this classic tale. The film follows Bathsheba Everdene, a young woman who inherits a large farm, and the three men who would like to be involved with her. In this adaptation, Everdene is played by Carey Mulligan, and Mulligan delivers an outstanding performance that anchors the film. The three suitors are a sheep farmer, Gabriel Oak (Matthias Schoenaerts), a prosperous neighbour, William Boldwood (Michael Sheen), and an army sergeant, Frank Troy (Tom Sturridge). Out of the three, we spend the most time with Gabriel and we are immediately drawn into his plight when a tragic incident robs him off his livelihood. I’ve talked at lengths in previous reviews about the esteem in which I hold Matthias Schoenaerts and he brings the same brooding masculinity to his performance here, whilst also mastering a more than acceptable English accent. Michael Sheen is perhaps given the least material, but he’s a capable actor and he sells the character well, even if his time in the limelight feels slightly rushed. Frank Troy is a spiteful character and all credit for that must go to Tom Sturridge who crafts an excellent portrayal of the reckless soldier, whilst still maintaining a modicum of humanity underneath his smug exterior. Charlotte Bruus Christensen’s cinematography is wonderful and really brings out the beauty of the English countryside, with several long sweeping shots giving this personal story an epic feel. Vinterberg directs the film well, particularly in the lengthy dialogue scenes where he isn’t afraid to give the performances room to breathe, and this allows his actors room to shine. Vinterberg has delivered an excellent adaptation of Thomas Hardy’s novel, drawing outstanding performances from his cast and breathing life into this classic period drama. Recommended.